Jason Speth and Hawkeye C. recently shared some pictures of excellent examples of both Manufacturing Error Figures and “Warped” M.U.S.C.L.E. figures. 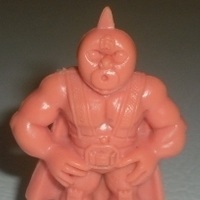 All M.U.S.C.L.E. collectors offer Jason and Hawkeye a huge thank you for sharing these figures! 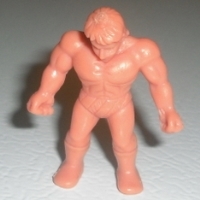 If you have M.U.S.C.L.E. 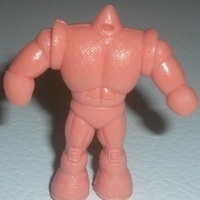 figures with factory errors or damage, please email a short explanation and pictures to the University of M.U.S.C.L.E.. This entry was posted on Thursday, May 12th, 2011 and is filed under Research, UofM News. You can follow any responses to this entry through RSS 2.0. You can skip to the end and leave a response. Pinging is currently not allowed. I meant to respond sooner. Oops. I think the answer is – it depends. If there is an almost insignificant piece of flashing that prohibits a figure from standing up, then it is probably not the worst thing in the world if you take an X-Acto knife and shave it off. However, most of the injection tags that are highlighted on UofM are pretty significant. I would hope that collectors don’t cut them off because they are (hopefully) interesting to many collectors. Personally I think they are especially because they not only made it out of the factory with the tag, but also survived a child not cutting it off. Auction Watch #69 - Interesting M.U.S.C.L.E. Auctions | University of M.U.S.C.L.E.